This mustard scarf necklace made it to Etsy’s front page last October. That made me happy! Awe, this is the first scarf I ever made. It was a super soft, 100% cotton, chunky yarn. I loved the cream color and remember being so happy that it actually turned out how I planned. This scarf now lives in L.A. 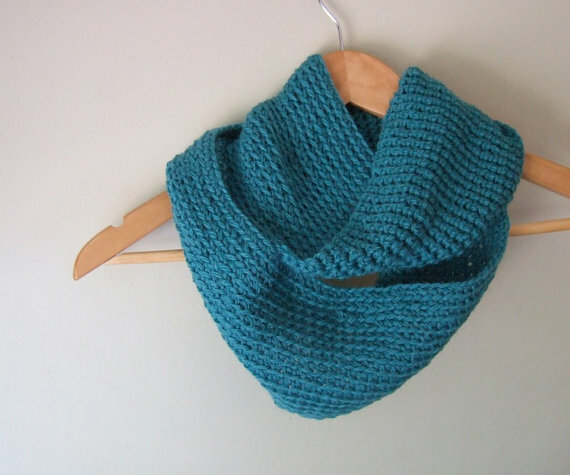 This warm teal blue infinity scarf lives with one of my favorite people in the world (my Grammy). This upcycled, pumpkin orange scarf now lives the furthest from me ~ about 7,935 miles (12,767.42 km) away in Hong Kong. …or this gray cowl. What? I have to make sure they are cozy! I hope you’ve enjoyed taking a look at the past year of coziness with me ~ there’s more to come this year. If you like what you see, don’t forget to enter to win a $50 DottieQ shopping spree at The Inkspot Workshop and check out my shop: DottieQ.Etsy.com Good luck! This entry was posted in Adventures, Style. Bookmark the permalink.